Time is running out to get the repotting done before the I apply the 'first storm' on September 1st. Many of the bulbs are already starting to make roots in expectation of the Autumn rains. 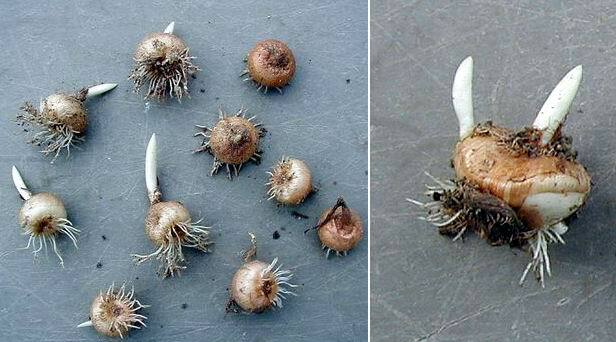 These Autumn flowering Crocus corms were stored in dry sand in a cool shed and as you can see their roots are already starting to grow, some even have their flower shoots extending. 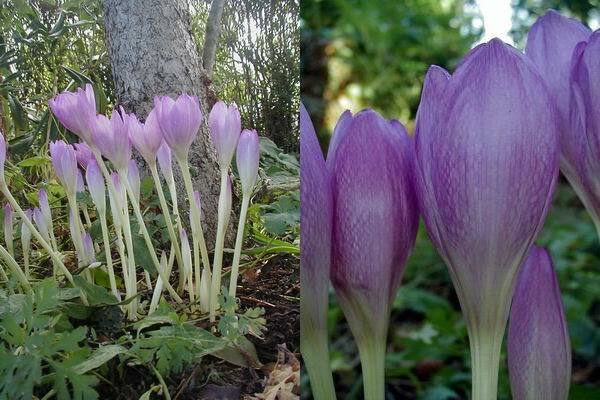 On the left is Crocus vallicola and the one on the right is Crocus banaticus which you can see has two flowering shoots emerging this will result in two corms next year, not all crocus multiply so well as this. One form of Crocus nudiflorus is already in flower in a plunge bed as well as all around the garden, it is among the first of the crocus to flower for us. It should be in a plunge basket but due to its stoloniferous nature it escapes out into the sand and adjacent baskets. It varies slightly from the other forms we grow in that it is smaller, more blue and always flowers a good bit earlier. The speed at which the autumn crocus can appear and burst into flower always amazes me, one day there is barely any sign and the next a beautiful flower. 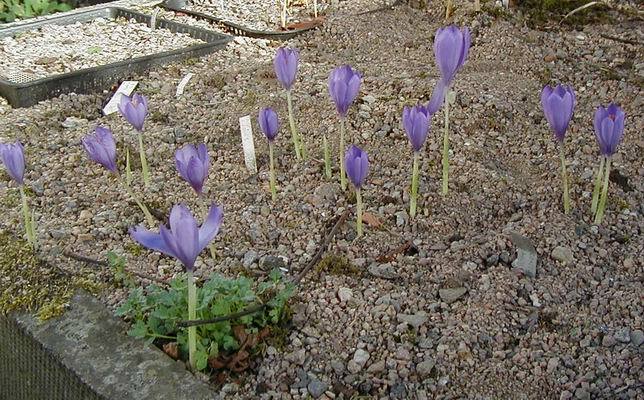 This resulted in a wonderful surprise yesterday when I went to one of the bulb frames to place a pot and discovered Crocus scharojanii flavus in full flower enjoying the sunshine and the attention of several hoverflies. 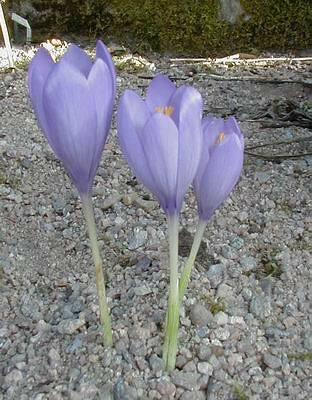 It is one of the real gems of the early flowering Crocus and it is thought that it may be a hybrid between Crocus scharojanii and Crocus vallicola. 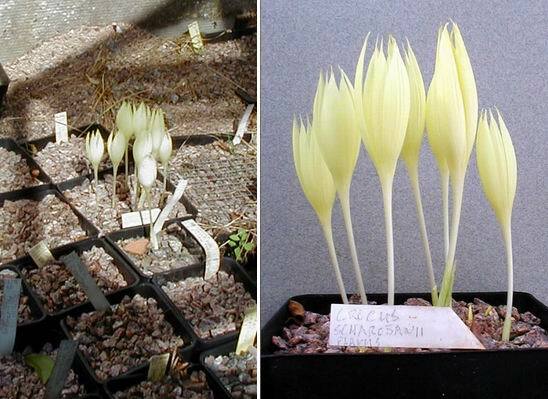 From its' appearance which is mid way between these two species I could go along with that - plus the fact that it is an easier bulb to grow than Crocus scharojanii (which I find very slow), this could be the result of hybrid vigour. Many of the Colchicums are also coming into flower now like this one that we just call 'checked hybrid' because of it's fine tesselations, we got it originally from an old garden and I dare say that it has a cultivar name but as we cannot be sure what it is we just stick with 'checked hybrid'. It is a very good doer, flowering every year and increasing well. A South African bulb that we have grown for many years has proved itself to be perfectly hardy. We grow it close to a small Rhododendron roxianum oreonastes that affords it an element of protection. 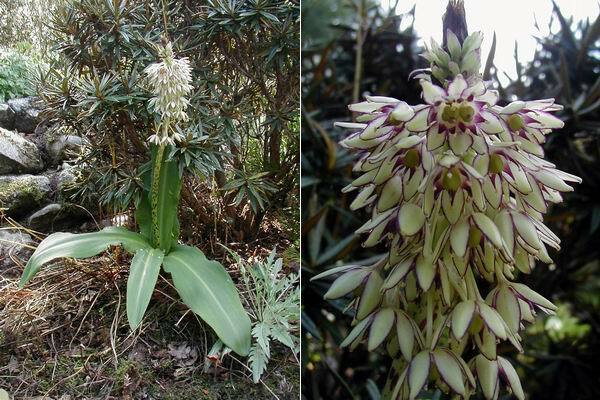 It produces the purple lined cream flowers most years, it has never increased or produced seed in the 15 years that it has been here. In the bulb house Cyclamen intaminatum is also flowering I just love the pink tinged white flowers with the grey stripes it is also one of the smallest cyclamen. It is hardy and grows well outside where it looks very well growing in a trough or raised bed. 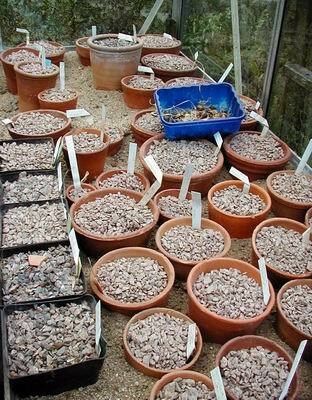 Getting back to the repotting we are getting the pots back into the sand plunges ready for next weeks watering and this always results in a pile of stray bulbs that result from seed that we fail to collect before it is dispersed into the plunge. Each year when we disturb the sand we trawl up another collection.